To my surprise I'm completely in love with Dermablend. My skin hasn't been at its best this month and I've reached for this every single day since it arrived in the post, completely abandoning my bareMinerals and Bourgois Healthy Mix foundations. 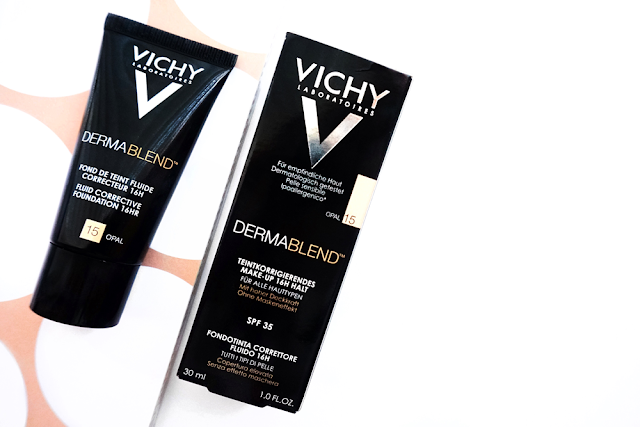 The formula of Vichy's Dermablend Corrective Fluid Foundation is simply amazing. It has such a bendable texture that seems to just melt into the skin, it feels extremely lightweight and the lasting power is so impressive. The first time I used this was before a friend's birthday night out (risky, I know). Alongside being thrilled with how lovely my skin looked straight after application it also managed to last from 4pm to 2am without any touch ups. I definitely think using the Dermablend Setting Powder* helped keep any oil at bay, but I even think I could wear this alone without powder for at least 6 hours without getting oily! 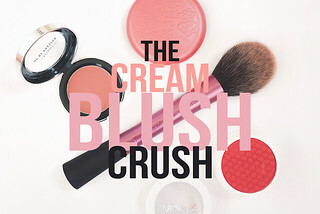 And usually I would never dream of not applying a powder on top to set my foundation. I also applied this on my friend Lucy the same night and she's actually purchased a tube of her own already! So well done Vichy, you've impressed us both! The extremely high concentration of pigments in the Corrective Fluid Foundation is the reason this foundation is so beautiful. I only need a pea size amount to cover my entire face and I prefer to apply it to the back of my hand first, warm it up in my fingers which helps to thin out the consistency and then dot the foundation all over my face. 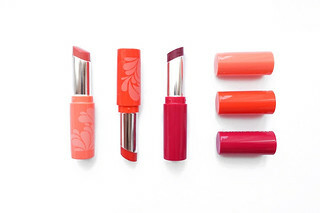 I blend initially with my fingertips, again I think the warmth helps with blending, and then I like to take a Beauty Blender to finish the application. As I don't have severe acne or scarring I find that using a damp sponge like the Beauty Blender allows me to thin out the coverage in certain areas (I like to add less to my cheeks so my freckles can peak through!) I tend to spot conceal with the foundation in my problematic areas and due to the high coverage I only reach for concealer to apply under my eyes. One tiny problem that I have with this is that it can be slightly drying on my nose after I've used this for a couple of consecutive days but if I apply a thick moisturiser at night the problem is solved straight away! Now my skin has cleared up a little bit more I think I'll be switching back and forth between this and my other favourite foundations but whenever I'm in need of a full coverage, matte foundation I'll definitely be opting for Vichy. 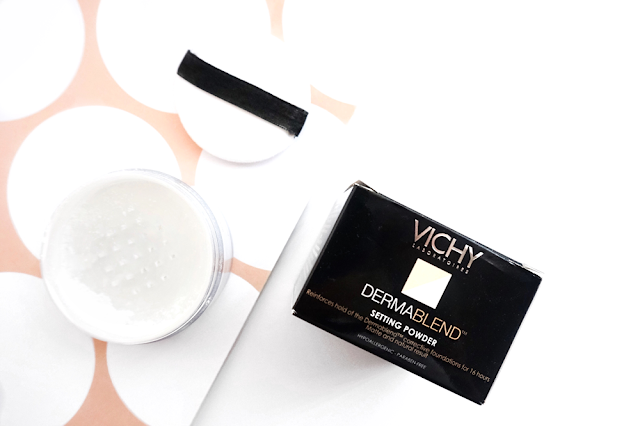 To add to the impressive wear time of the foundation I set it with Vichy's Dermablend Setting Powder*. I know my review has been ridiculously positive already but I think this might be the star of the show purely because I can finally set the concealer under my eyes without any creasing. The setting powder prevents creasing completely and I'm astounded. It's also my first time trying out the 'baking' trend which may add to my amazement but nevertheless I'm very impressed! For under the eyes I apply quite a bit of powder with the little powder puff that is provided and let it 'set' for a few minutes before dusting off the excess with a power brush. For the rest of my face I lightly dust this all over as I would with any other powder and it leaves my face looking smoother with a matte finish. 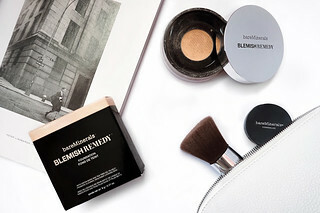 The Dermablend Setting Powder is very fine and white in colour, making it a great option for every skin tone as no extra colour is added to the face. It also seems to create an extra protective barrier against the outside world and whatever foundation I use with this I notice an increase in its wear time. At £15 it is quite expensive but you do get a huge 28g of product and only a small amount is needed every time. I don't think I could have had a more positive introduction to Vichy and I'm beyond happy that I've discovered 2 new products that I reach for almost every single day. Although I still love a dewy, medium coverage look it's so reassuring to know that I have a fantastic foundation in my beauty arsenal to tackle any problematic areas. 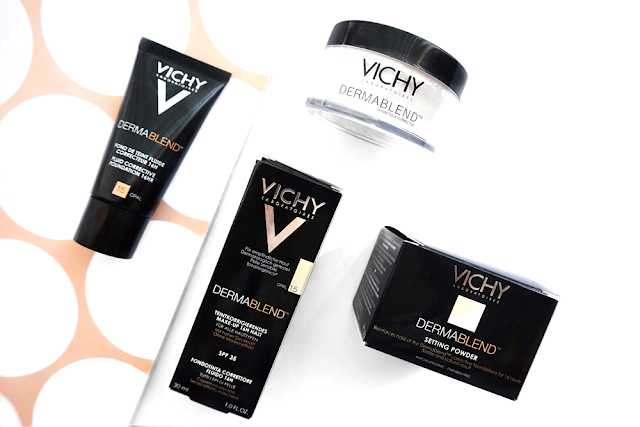 Let me know what coverage you prefer and if you've tried Vichy's Dermablend foundation I would love to know your thoughts!